I wanted to love this book. I love Laura Ingalls Wilder and I read it just as I was leaving to go on a trip during which I'd go to two Laura houses - her and Almanzo's home in Mansfield, MO where she wrote all the books, and THE Little House on the Prairie (reproduction) near Independence, KS. But while it was sweet and hopeful and the height of Laura-fandom, in the end it was a little disappointing. It just wasn't special enough. Kelly went to a good college and graduate school, but ended up waiting tables for years in her college town without any prospects, either career-wise or relationship-wise. And so she decides to move to Montana. 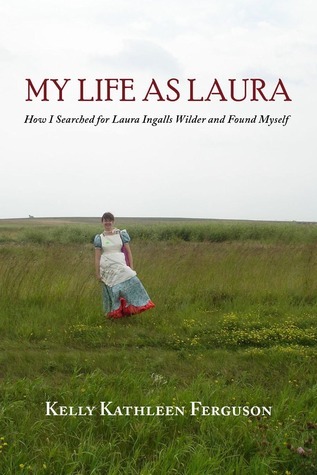 And she decides to trace the path of Laura Ingalls Wilder in her immortal books, The Little House Series. And she decides to do this while wearing a "prairie dress" which she buys at the last minute so it's short-sleeved, with a hot-pink hem and doesn't quite fit. While traveling she gets over her fear of going out in public in a prairie dress and becomes a little more comfortable talking to strangers. But there are no big revelations. Her relationship with "her Almanzo" fizzles out. I don't really learn anything about Laura that I didn't already know. My enthusiasm for Laura is in no way dampened (as Kelly's isn't either), but overall, the book was just rather... bland. It was easy to read and I think I would like Kelly, but the book didn't stick with me and I think any book about a solo road trip is inevitably going to be a tough one to make sing. When there is no one to talk to, to act as a foil, an ally, a confidant, you lose a lot. Ms. Ferguson had her work cut out with the book she set out to write. That said, I did love her enthusiasm, her perseverance, and her optimism. All traits we both love in Laura Ingalls.